George M. Abbott taught political science at Okanagan University College at Salmon Arm until his recent election as MLA for Shuswap. Nick Blomley is associate professor of geography at Simon Fraser University. He is active in community politics in the Vancouver area. Stephanie Bolster recently won the Bronwen Wallace award for poetry; her first collection is forthcoming from Véhicule Press. Born and raised in Vancouver, she is now living in Ottawa. Brian Brettis the author of several books of prose and poetry including Fossil Ground at Phantom Creek, Smoke Without Exit, The Fungus Garden, and Poems New and Selected. He has just completed his latest novel, Coyote. Mr. Brett lives with his family on Salt Spring Island where he cultivates his garden and creates ceramic forms. Patrick Lane is an internationally-known BC poet whose most recent book of poetry, Too Spare, Too Fierce, received the BC Book Award. Mark Leier is an associate professor of history at Simon Fraser University. His latest book is Red Flags & Red Tape: The Making of a Labour Bureaucracy. Robert A.J. 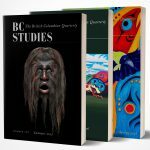 MacDonald teaches British Columbian history at UBC and has recently published Making Vancouver: Class Status and Social Boundaries, 1863-1913. Bryan D. Palmer is a professor of labour history at Queen’s University, Kingston, Ontario. Veronic Strong-Boag is Director of the Centre for Research in Women’s Studies and Gender Relations at UBC, past president of the Canadian Historical Association, and author and editor of numerous publications on BC and Canada and in women’s history. Jill Wade is senior tutor in history and fine arts at the Open University, Burnaby, and author of For All.